KUALA LUMPUR: The Public Accounts Committee (PAC) has fixed Aug 4 and 5 for a hearing with 1Malaysia Development Bhd (1MDB) president and group executive director Arul Kanda Kandasamy and former chief executive officer Datuk Shahrol Halmi, in relation to a probe into the strategic investment fund, after the duo failed to show up last month. 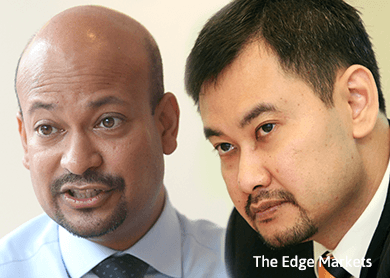 Sources told The Edge Financial Daily that the letters, requesting that Arul and Shahrol attend the upcoming hearing, had been sent out by the PAC, giving them more than a month’s notice. Both Arul and Shahrol were absent from the first hearing on May 26, citing short notice and that they had made business travel plans. “They have been summoned to the hearing by the PAC on two separate dates, on Aug 4 and 5. The PAC decided to do so to question each [of the duo] individually,” said a source close to the matter. However, it is uncertain who will appear first before the PAC. To recap, the PAC is conducting an inquiry into the debt and cash flow problems of 1MDB, which has accumulated debts totalling RM42 billion to date. Meanwhile, it is understood that audit firm KPMG is to give its statement to the PAC on 1MDB today. KPMG reportedly signed off the 1MDB accounts within a month of assuming the auditing role in September 2010, after Ernst & Young resigned as the auditors five months after financial year 2010. “So far, there is no indication that it (KPMG) will not show up for the PAC meeting,” another source said. KPMG, which is 1MDB’s second auditor, did not sign off the fund’s accounts for the financial year ended March 31, 2013 (FY13). Last week, the PAC queried Deloitte, which audited 1MDB’s FY13 financial accounts. Deloitte was represented by its country managing partner Tan Theng Hooi, partners Ng Yee Hong, Cheong Thoong Farn and Mark Thomson, senior manager Edwin Tan and the firm’s lawyer Malik Imtiaz Sarwar. Last month, Treasury secretary-general Tan Sri Dr Mohd Irwan Serigar Abdullah and Economic Planning Unit director-general Datuk Seri Dr Rahmat Bivi Abdullah were the first two to be called to give their statements to the PAC. On a separate note, PAC chairman Datuk Nur Jazlan Mohamed yesterday said the finance ministry (MoF) is expected to provide the PAC with a written report on actions taken against those investigated and found guilty in the 1MDB saga. The MoF’s response is expected to include actions taken to improve and punish officers involved in the wrongdoing. “It is one of the methods the PAC use to close the loop. Once we are finished with 1MDB, we will then table it in Parliament and have them respond to us accordingly,” Nur Jazlan told reporters yesterday. Nur Jazlan explained that all of the PAC’s recommendations and reports to Parliament are sent to the MoF, asking for a reply that will require them to give an official response to the PAC. Under the Treasury Directive 304, it is required for the MoF to submit its written replies to the PAC recommendations that involve actions taken against the wrongdoing.